This week the University Salford hosts it’s very own academic conference dedicated to the musician and artist, Prince Rogers Nelson. The conference aims to “provide fresh perspectives on the creative and commercial dimensions of Prince’s career”; with this in mind and as a fun means of preparation, I have compiled a playlist of tracks from the last fifteen years of Prince’s life. I’ve chosen 2001-2016 as the new music he was creating in this period is often ignored. By this point Prince had embraced his role as a “legacy act” and from 2004’s Musicology Tour onwards regularly played the hits to packed out stadiums, the downside of this was that his latest album would hastily be disregarded by most with nary a listen. After all how could Prince compete with the genre hopping success that was his own 1980s (pardon the pun) purple patch? Not that he helped the situation, for all that has been written about Prince’s canny post-Warner Brothers distribution methods they didn’t always make his latest offering readily accessible to the public. While he doubtless was fairly compensated, a free CD with the Daily Mail probably didn’t ensure enduring radio play. Prince may have ceased swearing and sexual explicitness after taking up the Jehovah’s Witness faith but that doesn’t mean that he didn’t continue to push other boundaries. The list that follows isn’t meant to be definitive or even representative of my favourites from this era, what these songs do offer is evidence that Prince even in his final years was still searching and growing as an artist. Originally slated to be the title track of an instrumental album, the studio version of Xenophobia was removed at the eleventh hour and the project was rechristened Xpectation. Thankfully a live version had already featured as part of the One Nite Alone...Live! set issued in 2002. Inspired by the USA’s heightened border control post-911, Xenophobia is one of Prince’s most satisfying jazz compositions – militaristic with frantic interludes. The recording, from a Portland show, also boasts the well honed interplay between Prince and the contemporary NPG members. Having admired him since childhood, Prince finally extended legendary James Brown saxophonist, Maceo Parker an invitation to join his band for this tour and when Prince asks of the crowd “y’all know who that is?” that admiration shines through. Factor in the showboating solos he allows from keyboardist, Renato Neto and drummer, John Blackwell and we’re privy to Prince the proud band leader. The late 90s saw the rise of the neo-soul movement, a term concocted to distinguish R&B that was taking a back to basics song writing approach. The likes of Erykah Badu, Raphael Saadiq, Lauryn Hill and India Arie all spoke of Prince’s influence and ‘U Make My Sun Shine’ is him returning the compliment. The presence of Angie Stone as duet partner has been interpreted by some quarters of purple fandom as a mind-game Prince directed toward D’Angelo with whom Ms. Stone was recently separated and was then being hailed as old skool R&B’s saviour. Unlike many songs of this era which frequently featured boasts about the romantic escapes his wealth could buy, ‘U Make My Sun Shine’ makes Prince the humble suitor, an identity often assumed in his early songs like ‘I Wanna B Your Lover’. Unlike her man that calls her names behind her back, Prince is appreciative of Stone’s inner queen. Anyone familiar with Prince’s long-time band mate, Shelby J. will appreciate the playful effect that a powerful, female gospel voice has on Prince and for every full belt vocal by Angie Stone, Prince matches her note for note. Like fellow 80s icons David Bowie and Michael Jackson, Prince was partial to musical theatre. In 1994 he even premiered his own show based on Homer’s Odyssey, Glam Slam Ulysses, so it was no surprise when he returned to this territory in 2004. The Dance is a theatrical seduction directed to a woman with whom Prince can’t entertain mere friendship as they are destined to be together carnally. The song starts off as a slow tango but evolves into a passionate guitar solo and Prince’s trademark screaming vocals. Recorded and released for two albums with slightly different arrangements, 3121’s version of The Dance has the edge. Though Prince spent his career avoiding being pigeonholed, his identity as a black man that played guitar often meant he was compared to Jimi Hendrix. While on the one hand this could be a compliment, it’s also slightly reductive and a comparison seemingly based only on the colour of his skin rather than playing style. In fact Prince’s guitar chops had far more in common with Santana or Van Halen. It wasn’t until 2009s Lotusflow3r album that he truly paid homage to Hendrix in the studio. Boom is a psychedelic trip through the galaxy accompanied by spacey guitars, taking in “butterscotch mountains” and a “celibate mushroom canopy” whatever that is. Such are the far out nature of the lyrics that it is hard to decipher whether they’re secretly coded wisdom or Prince’s grocery list. I suspect the latter and therein lies the genius. Prince’s forays into hip hop have been much maligned and with eyebrow raising raps like “18 and over I wants to bone ya” this is perhaps understandable. How Laydown succeeds where others have failed, is by offering a sense of self deprecation, “from the heart of Minnesota here come the Purple Yoda, guaranteed to bring that dirty new sound”. 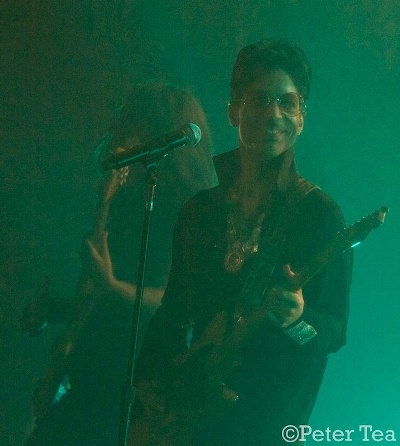 Prince employs his trusty drum machine, peppers in some kitsch computer sound effects and employs backing singers, Shelby, Elisa and Liv as his hype-women. While his live sets would often feature offbeat covers from Radiohead to Sly and The Family Stone, the list of covers that made into onto a Prince album is relatively short. When he did select a cover it tended to be something from his youth, The Stylistics’, Betcha By Golly Wow, or Joni Mitchell’s, A Case of You. Prince must have responded then to Alice Smith’s 2013 song, Another Love, as he completely imprints on it far more than just renaming it using his famous ‘Princebonics’. ANOTHERLOVE reworks the soulful ballad into a hard rocking blues number with Led Zeppelin-like riffs. Those who have heard Prince’s first wife Mayte Garcia’s stories of her former husband borrowing her clothes will find knowing amusement in the line “everything we used 2 share our clothes and even our hair”. Prince was rarely straightforward about his emotions. While songs like If I Was Ur Girlfriend or Eye Hate U take on greater significance when the personal circumstances under which they were written are taken into account, the level of candour on display in Way Back Home is revelatory. Prince asserts his self image as an outsider, “There's so many reasons why I don't belong here” and addresses his own bloody-mindedness, “Power to the ones who could raise a child like me”. The song cleverly uses the percussive pulsing of an ultrasound of Prince’s heartbeat and as if further heightening the theme of vulnerability production is co-credited to Joshua Welton – a rare instance of him allowing someone else control behind the mixing board. Having created a gluttony of syrupy love-making ballads in the preceding years, it was refreshing to hear Prince return to passionate intensity. The Peach and Black Podcast is run by four Australian Prince fans. In their October 2015 review of HITnRUN Phase One, host Rob Esse, suggested that had HARDROCKLOVER had the right promotional backing it had the potential to be a radio hit. It’s hard to disagree. The track finds Prince in storyteller mode, recounting the tale of a woman that makes love to the sounds of hard rock as opposed to “Sade and Babyface”. Having created a gluttony of syrupy love-making ballads in the preceding years (Future Baby Mama, Mr Goodnight), it was refreshing to hear Prince return to passionate intensity. Prince shreds his guitar as he describes his partner getting increasingly turned on by his prowess with the axe. It’s a pity this song never got a live outing as the end chant, “she likes to party hard, she’s a hard rock lover” was meant for audience call and response. Right up until the end of his life Prince was inviting new musical voices into his studio; Revelation sees saxophonist Marcus Anderson take centre stage for a goosebump-inducing solo. This jazz ballad oozes class as Prince employs his falsetto to impart a story of a love that spans multiple lifetimes. It is to Prince’s credit that a song about sexual ecstasy (the titular Revelation likely refers to climax) never drifts into seedy territory as it so easily could in lesser hands. This life affirming ditty was one of Prince’s last singles before his death and sonically it finds him in a reflective mood, employing a synth hook that would be the envy of La Roux or Hot Chip today or comfortably fit on 1981s Controversy. The lyrics are admittedly generic, self motivational fluff, “life is what you make it, be the best that you can be”, but the joyful enthusiasm with which he and backing vocalist, Judith Hill attack the a cappella section at the fade out is a winner. Free Urself, If Eye Could Get Ur Attention and Ruff Enuf were all made available for download as ‘Purple Pick of The Week’ on Jay Z’s streaming service, Tidal and offer us a tantalising glimpse of the next album we sadly never got to hear. The University of Salford's Prince Conference takes place 24th - 26th May, details can be found here.